If you watch Top Chef, you’ve heard the term gastrique (gas-TREEK). While it sounds like the French word for gastric system*, it’s actually a sweet and sour sauce, similar to the Italian sauce agrodolce (agro-DOLE-chay, meaning sour [agro] and sweet [dolce]). Gastrique and agrodolce have a broad use: as sauces for meat, poultry, fish, pasta sauce, vegetables—even dessert (where chocolate can be used instead of the sugar), and to flavor cocktails. They’re good pairings for dishes that are high in fat content, since the vinegar cuts the richness. The sauce is made by reducing sweet and sour ingredients, typically sugar and vinegar. The sauces are very similar and the terms are often used interchangeably, but there is one key difference: With a gastrique, the sugar is first caramelized in a pan over low heat. 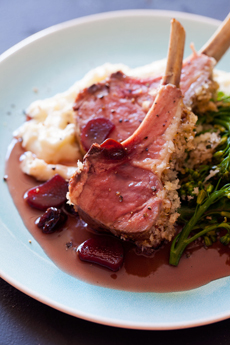 The sticky syrup is deglazed with vinegar, and stock is added to thin the sauce. Additional flavorings can be added to create a more complex sauce—often fruit and/or wine; and flavored vinegars can add still more flavor. Both the type of stock and the vinegar greatly affect the flavor of the finished sauce. Red wine vinegar and vincotto, for example, contribute a raspberry or grape flavor, respectively, that pairs well with chicken, lamb, pork, and seafood. Cider vinegar has a sharper flavor, and is used with spicier dishes. Gastrique or agrodolce made with preserves creates a flavorful bread dipper. Pair your vinegar choice, stock, fruits, spices, etc. to the dish. Duck à l’orange is a good example. But you can also use an orange sauce with sea scallops, as in this recipe from NewFinMySoup.blogspot.com. 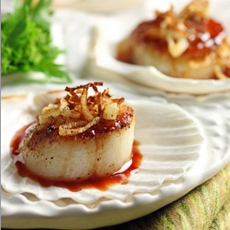 Chef Marcus Samuelsson and bloggers Smith & Ratliff among others, have a similar scallop recipe. Just do a web search for anything you want to make, plus gastrique (e.g. “chicken gastrique”). 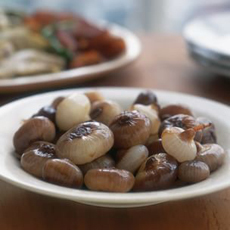 Also consider the classic Italian onion side and antipasto dish, Cippolini in Agrodolce. This recipe, from Williams-Sonoma, uses white and brown sugars and white wine and balsamic vinegars. In Italy, sweet peppers also get the agrodolce treatment. Consider this elegant sweet-and-sour sauce for Asian dishes—very different from cornstarch-thickened Chinese sweet and sour sauce. Drizzle it over steaks or chops. Use it as a salad dressing. The options go on forever. *In French, gastrique plus a modifying word refers to gastrointestinal matters (e.g., suc gastrique is gastric juice). Top: Seared scallops with blood orange gastrique from Center: Rack of lamb with rhubarb-sour cherry gastrique from SpoonForkBacon.com. Here’s the recipe. Bottom: Cippollini in Agrodolce from Williams-Sonoma.